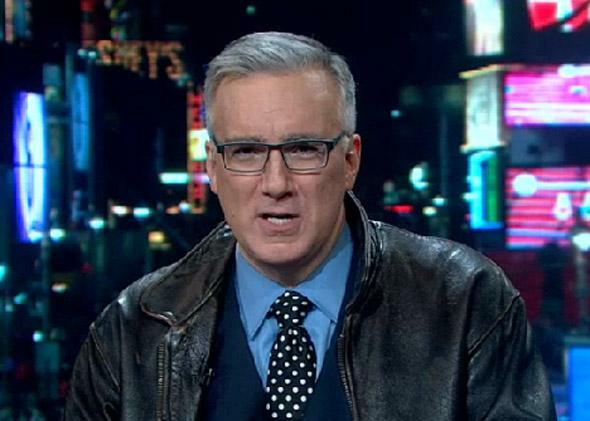 Keith Olbermann ESPN: The return of the prodigal sportscaster. The prodigal sportscaster returns to ESPN. Fifteen minutes of media criticism, three mentions of Miley Cyrus, two jabs at capitalism, two interviews, two installments of “Keith-lights,” one view of Times Square, one Martin Luther King Jr. shoutout, one endorsement of a Chris Christie opinion, and one tear-jerking acknowledgment of a recently deceased third-grade teacher that Aaron Sorkin would not have written any differently—these are some of the statistics from the premiere episode of the already-entertaining, not-yet-correctly-calibrated Olbermann, Keith Olbermann’s much-ballyhooed return to ESPN and a nightly program on which Olbermann will talk more about sports than politics. In lieu of Republicans, Olbermann, whose charm is a form of exasperation, still needs a target. For his very first show he decided to take aim at the establishment he once again finds himself a part of: sports media. This opening salvo of independence worked far better in theory than in practice. The segment was supposed to play like a Daily Show bit, in which Olbermann amassed mounting evidence that the sports media is ridiculous and “makes things up” on the hunt for a narrative. Obviously, the sports media can be ridiculous and does engage in near-endless speculation and theorizing, but the segment was long and unfocused. Olbermann spent most of his time specifically calling out the Jets beat reporter and the contradictions in his body of work instead of broadening out to the myriad other sport outlets/conspiracy theorists that got in on the Ryan story on the strength of a tweet. Among those outlets, needless to say, was ESPN. In a segment that purported to be a take-no-prisoners look at sports media, Olbermann blamed desperate newspapers, not his current employer, for the current state of athletic discourse—as if New York tabloids just got the impulse to stir things up over the weekend, and the high-minded fellows on ESPN’s First Take would never dare to bloviate. It took guest Mark Cuban to point this out, in an aside later in the show. “Welcome to the Skip Bayless network,” Cuban told Olbermann, lumping in ESPN’s prodigal son and the Worldwide Leader’s windbag-in-chief. If you’re going to question the system from within, there are bigger culprits than the Daily News. After the opening segment, Olbermann settled in, conversational and cocky. The rest of the show sped along, a mish-mash of interviews, highlights, and flashbacks to Olbermann’s earlier ESPN days (oddly, it’s the highlights and not the flashbacks that are referred to as “Keith-Lights”), and a couple of solid recurring segments. One of those was Worst Persons in Sports, a rehash of his old Countdown shtick in which Olbermann calls people out for 30 seconds at a time. Olbermann, even when his zingers don’t quite zing, is fun to watch. Olbermann’s little wince after he admitted to agreeing with Chris Christie (who also thinks that Jets beat reporter is an idiot) was priceless, as is his endless dedication to verbal hijinks. Olbermann doesn’t spout sports platitudes. You are much more likely to hear “I’m not an anti-capitalist, but this is what capitalism does, it forces us to eat our own” on Olbermann, courtesy of first guest Jason Whitlock, than “Give [x] a lot of credit,” the sports equivalent of um. With just a few minutes left, Olbermann changed gears to talk about his third-grade teacher, Mrs. Plant, who recently died. Her obituary had said that she was proud of having taught Olbermann, though “She took no credit for his success.” That, Olbermann said, “was the only thing I know of about which Mrs. Plant was ever mistaken.” I’m a sucker, but I teared up. Which means that—TV gods help me—while watching the very first episode of Olbermann, I laughed and I cried.